Express love with a feminine twist on a timeless style! These earrings are versatile with an affectionate accent. Brushed-finish hearts adorn these shining hoops, adding an unexpected touch that's sure to bring a feeling of warmth. This pair is an ideal gift for any special person in your life, and will continually remind them that they are close to your heart. Or, wear them on your own ears as a just-right accent that gently draws eyes in and communicates a message of warmth and affection. And, since that message is crafted from solid 14K yellow gold, it's a message that will last. 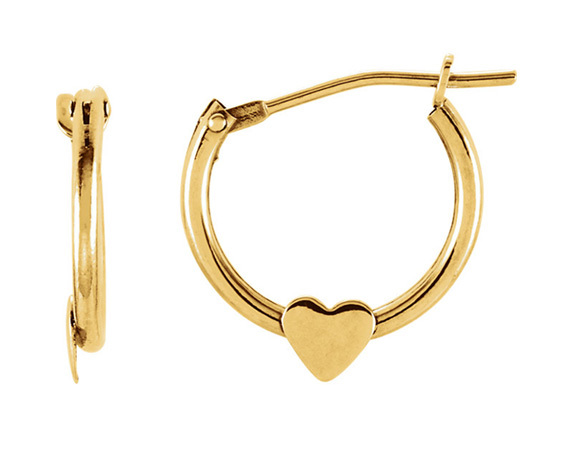 Petite Hoop Heart Earrings are made in 14k yellow gold. We guarantee our Petite Hoop Heart Earrings, 14K Yellow Gold to be high quality, authentic jewelry, as described above.